Hôpital Vétérinaire Victoria - What is a scratching post and what is its use? 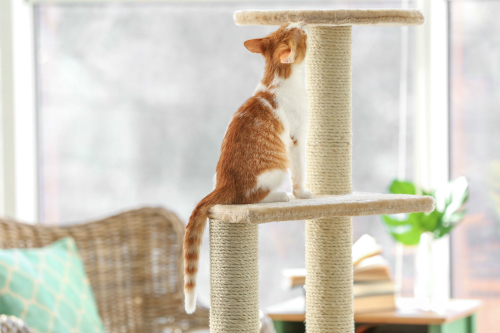 What is a scratching post and what is its use? Few years back, it was commonplace to have your cat «declawed». This surgery, called onyxectomy in veterinary jargon, is actually a phalangectomy. This is in fact the amputation of the third and last phalanx of all the fingers of the animal. The images that this brings to mind are shocking but our sole purpose is to help start a conversation about the reasons for requesting this procedure and the alternative options available to you and your cat. It is well known that this procedure is called to disappear. Indeed, more than 39 countries around the world are already opposed to «declawing» of pets and some even perceive this surgery as being torture for cats. There are different reasons for requesting an onyxectomy, but two of them return more often. First, to protect the furniture in the house from being scratched and secondly to prevent injuries caused by claws. However, there are different options available to you to avoid surgery and the risks associated with it. For example, regular claw cutting will shorten the claws and make sure they do not hurt any family members. There are also claw protectors that will protect your furniture. Another option we offer is the use of a scratching post. Let's talk about to the famous scratching post. This very common tool but seldomly used properly or to its maximum potential. You probably know that cats are very complex and difficult beings. You can buy them the most beautiful cushion, they will prefer the bag that the cushion came in... Same principle for scratching posts! You need to know which, how and where to use it to make sure your kitty uses it properly. There are different types of scratching posts to meet the needs and preferences of each cat. Here are the 3 points to remember for optimum use of the scratching post. Material and textures: You should definitely think about the fun and joy the scratching post will bring to your cat. Necessarily, the texture of the scratching post will have to suit your cat as well as being enjoyed by him. Just like humans, cats have different tastes from each other, so we advise you to have your cat discover different textures, such as cardboard, strings or carpets. Location:There is a logical reason why your cat picked some furniture rather than others to «claw». It is important to know that your cat marks its territory in different ways. Among other things, when a cat rubs his chin on a door frame or when he claws on your couch. Marking is usually done in an environment frequently visited by the family. So your sofa that sits in a central location of your home or apartment is an excellent place to delineate your cat's territory. With that in mind, you should put the new scratching post where it will be well used. Unfortunately, the corner of a room is a place little frequented by cats but where several owners place the famous scratcher. Although the post is not a very aesthetically pleasing item, it will still have to be placed strategically where your cat will want to claw and not where you would like for your cat to claw. Height and stability: It's well known that cats love to stretch. The post will therefore allow him to stretch out, so a height of 36 inches should be enough to allow him to stretch properly. In addition, the scratching post must be stable. If your cat claws at it and it moves and is unstable, he may not want to go use it anymore. In nature, big cats use trees as a scratching post. So think about stabilizing the one used by your little feline. However, keep in mind that some cats will prefer a horizontal scratcher. If your cat has already started to damage a place such as a sofa or a carpet, make that place as unpleasant as possible for your cat to then redirect him to the scratching post. A little trick to make places less pleasant would be to install aluminum foil or plastic tarps that make the area less attractive to your cat. Once he does not want to go to this area anymore, just install the scratching post nearby and your cat should make the transition to his new territory! You can even put a little catnip to entice him even more. If you have any questions or concerns about your cat's claws, do not hesitate to speak with a member of our team. We are here to guide you.